Every good day begins with a good breakfast. Every bad morning can be fixed by a great breakfast! This morning, I awoke to a wonderful smell drifting through my open bedroom doorway. Led by my nose, I followed the scent to the kitchen and was greeted by fresh crepes frying on the griddle. I cannot describe the feeling that washed over me as I sat and began to eat. The delicious aroma coming from the kitchen was a heavenly wake up call, and after eating such a wonderful breakfast, I was ready to face the day! Crepes can be eaten in countless ways, depending on personal preference. I adore crepes with fruits. This morning I feasted on Nutella and banana crepes, a delight I discovered this past summer in Paris. Crepes can also be spread with other fixings, anything you may be in the mood for! Mix milk and eggs in blender, add the flour and mix some more. If the flour sticks to the wall, turn off the blender and scrape it off the wall. Add more flour if the batter is too watery. It should have consistency of soup. It's supposed to be thin, not like pancake batter! Melt butter on the griddle at medium heat. Spoon about a quarter cup of the batter onto the griddle and spread evenly. The crepe is ready to turn when the surface is dry. Turn with a non stick turner. When the bottom is golden brown transfer to a plate. 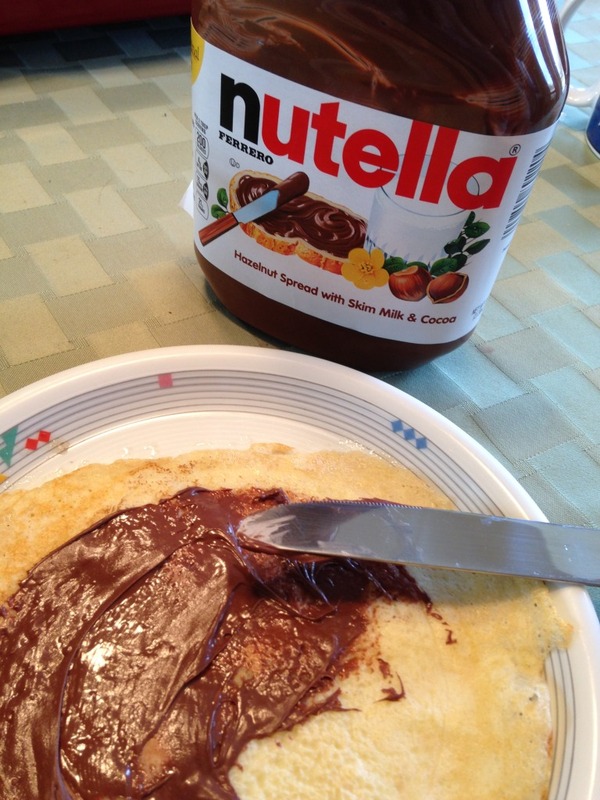 Spread Nutella or honey onto the crepe, roll up and enjoy! 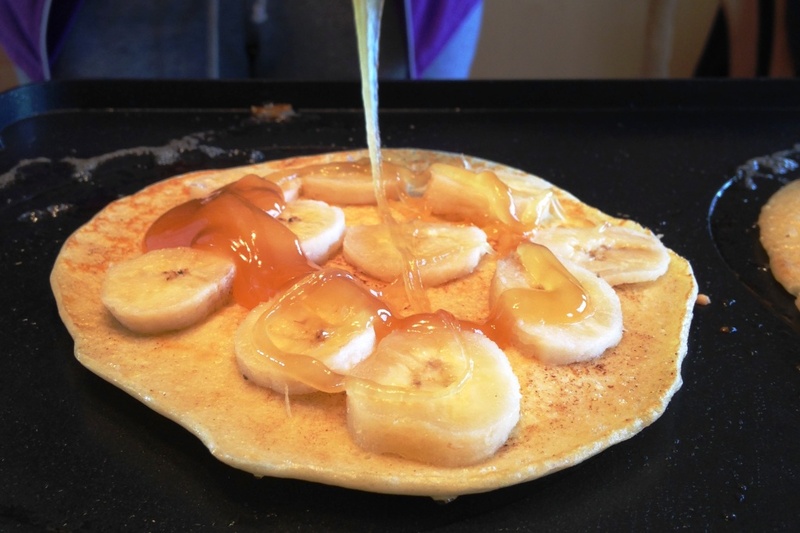 Or add sliced Banana and drizzle honey over it while still on the griddle. If you are interested in a grown up version of this recipe pour an once of Cointreau over the crepes after you placed it on a plate. Crepes can also be sprinkled with grated cheese and maybe some thin slices of ham for a more hearty version. 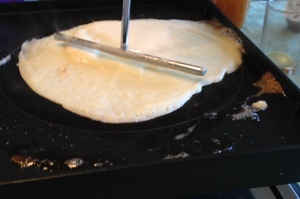 The crepes can be made on a griddle or in a non-stick frying pan.